The full set of Lledo diecast vehicles. 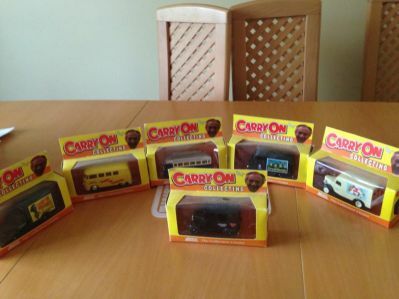 A British company called Lledo issued 6 vehicles 1998, inspired from Carry Ons films. There was the lorry from Carry On Sergeant, Carry On Teacher school bus, Carry On Cabby taxi, Carry On Constable Black Maria, Carry On Matron Bedford Ambulance and Carry On Camping VW Camper Van.